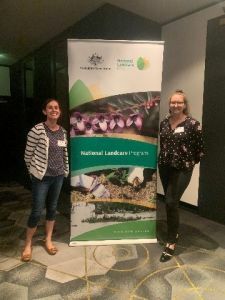 In early March more than 60 Landcare professionals journeyed to Canberra to attend the 2019 National Regional Agriculture Landcare Facilitator Conference. The two day conference consisted of a series of presentations and activities designed to encourage knowledge sharing and networking opportunities – and was attended by Regional Agriculture Landcare Facilitators (RALFs) from all across the country. 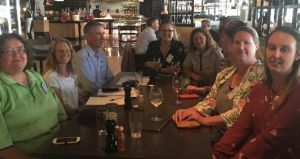 NACC’s two RALFs – Lizzie King and Annabelle Garrett – braved the cool Canberra weather and joined their counterparts to talk all things Landcare. The conference started with a passionate presentation from Nette Fischer, whose family farm in South Australia’s Mid-North was massively impacted by the catastrophic 2015 Pinery bushfire. Nette shared a story of resilience and positivity, and emphasized that even when facing the toughest challenges there are always opportunities; that farming communities are incredibly resilient, generous and willing to help neighbours; and to make sure you have adequate and up to date insurance. Another highlight was from Anangu man and Alinytjara Wilurara RALF Walter Tjami, who spoke about the important role of providing cultural liaison support and communication between NRM practitioners and Traditional Owners. The value of ground cover monitoring was discussed in the aptly named ‘Look under the Lid’ session. Ground cover is the vegetation (living and dead), biological crusts and stone that is in contact with the soil surface. The non-woody ground cover such as crops, grass, forbs and chenopod-type shrubs may change monthly, making this component a good indicator of land management performance. Watch this space for more information about a free on-line groundcover monitoring tool. Overall the conference was a success and provided the RALF network with greater knowledge and resources to promote sustainable farm and land management practices to protect our landscape. Annabelle said that one of the most valuable outcomes of the two days was having time to talk to and learn from others and making contacts to call upon in future. Coming back freshly inspired and more motivated than ever, Annabelle and Lizzie are very much looking forward to the future of their role as our RALFs and working with the wonderful community in the NAR. Annabelle Garratt (E) [email protected] (P) 0448 986 879.